Thanks to the hard work of dedicated volunteers and donors, after six years we have completed our one-of-a-kind fabricated friction slab training structure. On January 21, 2018, we held our official "rope cutting" ceremony, and the friction slabs are now open for learning! 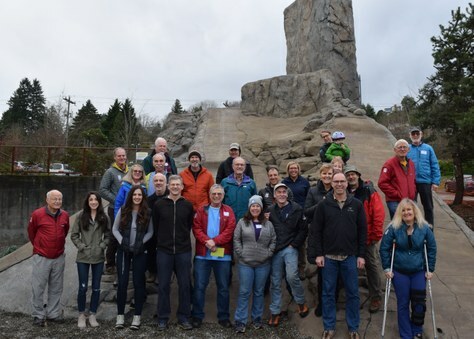 On Sunday, January 21, a group of 30 donors and volunteers gathered at the Seattle Program Center to celebrate the long overdue completion of the Friction Slabs project. The idea was born in 2012. Plans were drawn and funds were raised, however the process became much more of a lift than anyone could have anticipated. Fast forward six years, and we have (as far as we can tell) the only fabricated friction slab training structure in existence! John Wick, member of the Friction Slabs committee and Mountaineers Super Volunteer, made a wonderful presentation about the history of the project. He also recognized and thanked those most involved: Mark Holms, Mary Hsue, John Ohlson, Adam Rhodes, John Rijhoff, John Rollins, Stevie Russell, Dave Shema, Nicole Twadell, Timmy Williams, and Stephanie Willison. Shortly after John's presentation, the group ventured outside during a break in the rain for the official rope cutting ceremony! 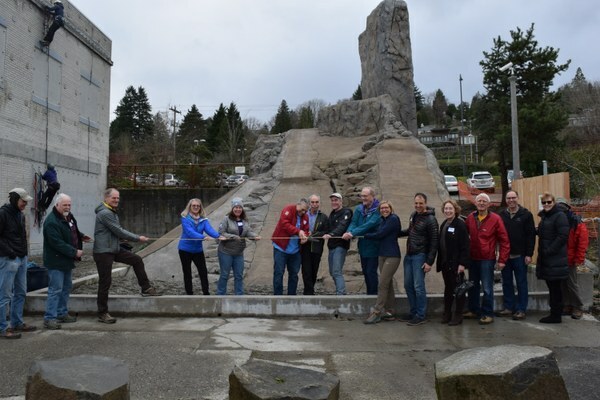 Volunteers, donors and the Friction Slabs committee readying to cut the rope. To see a full visual recap of the event, check out all of our photos on our SmugMug gallery. 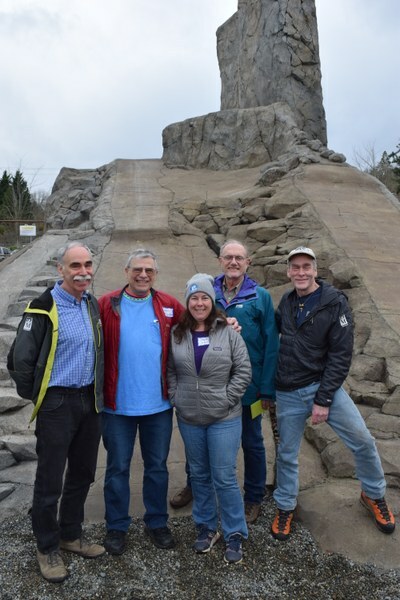 Friction Slabs Committee, from left to right: John Wick, John Ohlson, Stephanie Johnson, Tim Williams, Stevie Russell. We would like to extend a huge THANK YOU to all donors and volunteers for your phenomenal support of this project. Because of you, and your love for The Mountaineers community, we now have a new climbing structure where future Mountaineers can learn and grow. Want to learn more about friction/slab climbing? Check out Part 1 of a 3-part blog series, written by Super Volunteer Cebe Wallace, about the basics of friction climbing, the skills you'll need to master, and where you can go to practice your skills. To learn more about this structure, follow our project updates to see what went into making this dream a reality.